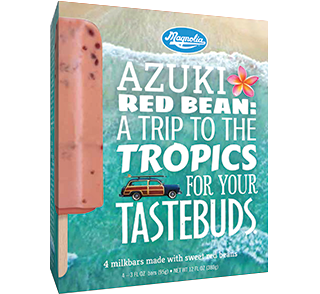 A little bit exotic, a little bit fun – that’s a good way to describe our Azuki Red Bean milkbars. Banzai! Like treasures in the sand, you’ll love it when you find the flecks of sweet red bean. So go ahead, start your tropical treasure hunt today. They’re tart, they’re tangy, and they’re made from imported Filipino citrus fruits with a serious identity crisis. Calamansi look like oranges, but taste like limes; the edible peel is sweet while the inside is sour. Crazy, but in a good way! 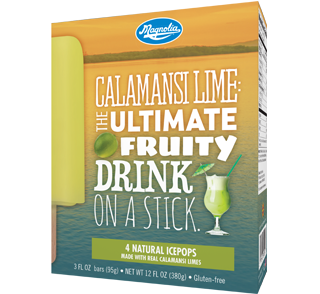 Deliciously addictive anytime, these zesty frozen treats are totally awesome on a hot day. Coconut- it’s the ultimate tropical taste sensation. But you don’t have to be at a luau to enjoy the sweet, nutty flavor. 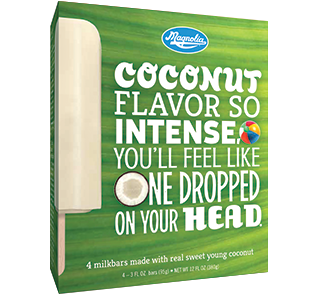 Enjoy it anywhere and everywhere with our Magnolia Coconut Milkbars. As one of the world’s largest coconut producers, the Philippines knows how to bring out its delicious nature. We combine the sweetness and chewy texture with the richness of real cream. Despite the luscious taste, our milkbars have just over half the fat of our Premium Tropical Ice Cream. This tasty mish mash of coconut, jackfruit, azuki beans and purple yam is based on a traditional Filipino summer treat, served with milk over shaved ice. But in this case, we’ve done all the work for you, blending these tropical delights with the richness of sweet cream. With just half the fat of our premium tropical ice cream, the delicious taste and texture will blow you away. 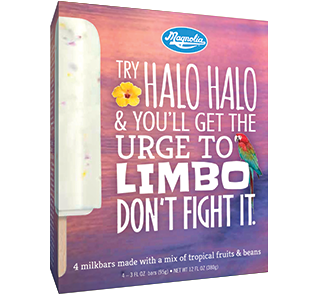 So grab a Halo Halo bar and discover just how “whoa!” you can go! Sweet and luscious. Silky smooth. Undeniably exhilarating. No, we’re not talking about catching a righteous wave. 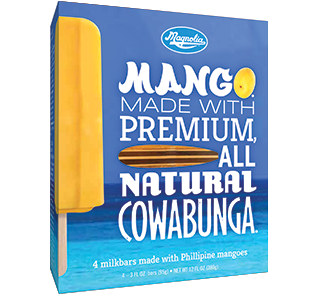 We’re talking about Magnolia Mango Milkbars. One bite will take you to another place – a more tropical place where you can hang ten, or just hang out. So go ahead – kick back, relax, enjoy. Using some of the finest tea leaves on Earth, we brew our own unique blend of Thai Tea, then add the richness of real cream. This makes a frozen treat that’s sweet with a slightly smoky finish. Even with all that flavor, our milkbars have just over half the fat of our Premium Tropical Ice Cream. 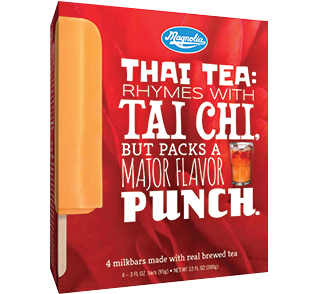 And while you may not be on a Thai beach when enjoying their incredibly refreshing taste, you’ll feel like you are.